Fred Perry are getting in the party mood and celebrating their 60th birthday with a huge competition where you can win £1,952 of product. Taking inspiration from their birth year (1952), the folks at FP are giving one lucky person the chance to win £1,952 of Fred Perry gear. A huge prize to say the least. The competition is only open for 60 hours – a symbol of their 60 years in business so far. 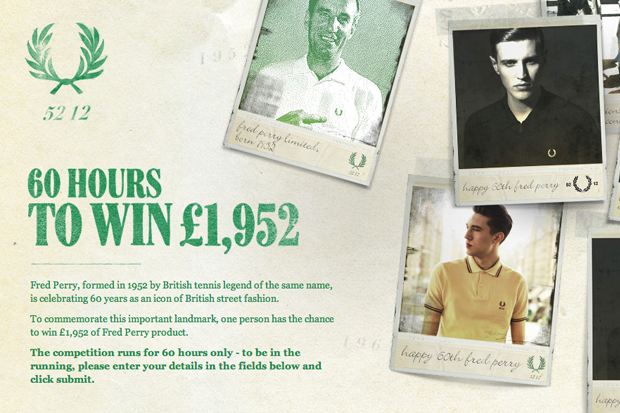 The clock started ticking as of midday today, so head over to the Fred Perry website and enter now. All you have to do is sign up to their mailing list. Simple. as I am a big fan, please make me win….